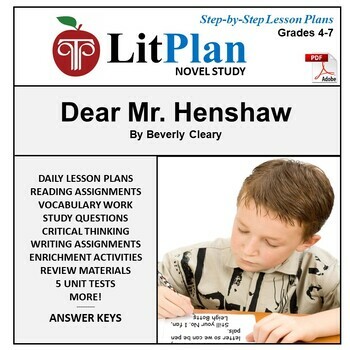 Essentially a complete teacher's guide and novel unit, this LitPlan Teacher Pack includes lesson plans and reproducible student materials for Dear Mr. Henshaw by Beverly Cleary. There are three writing assignments in this unit, each with the purpose of informing, persuading, or expressing personal opinions. In the first writing assignment, students tell about their perfect Christmas (or other holiday) Day. In the second writing assignment, students write a narrative summary of one section of the book, writing with certain conditions applied. In the third writing assignment, students write as Leigh to persuade one of his parents to do what is necessary to have them all live together as a family again. This LitPlan is in the extended second edition format with extra points to ponder in discussing each section of the book and re-ordered LitPlan sections with Daily Lessons before all resource materials. This elementary edition also has extra vocabulary pages you can either print out or use with your interactive white board for students to do additional work with the vocabulary words. These materials are geared for whole class use but are very easily adapted for independent study work, lit circles or book groups, home school use, or tutoring. If you have never taught this book before, this manual will give you a great foundation of materials on a variety of levels. 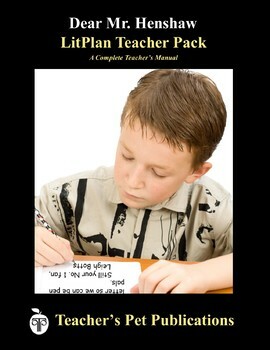 If you have taught this book before, you might like to know that many veteran teachers have told us they have found our LitPlan Teacher Pack manuals to be much more thorough and more helpful than other materials they have used. All publications are copyrighted materials, with permission ONLY granted to print materials as needed for ONE teacher's classroom use. Documents may not be reproduced or distributed in any other way without written permission from Teacher's Pet Publications.